Unas was the last king of the 5th dynasty and choose to build his pyramid near the southwest corner of Djoser's complex. A departure from the 5th dynasty necropolis at Abu Sir. It is here that we find the oldest religious text in the the world. It is also the first time the pyramid text appear, although evidence suggest that they date to the beginning of Pharaonic Egypt c. 3200 BCE. It is the smallest pyramid from the old kingdom, but the finest in terms of bas relief's. 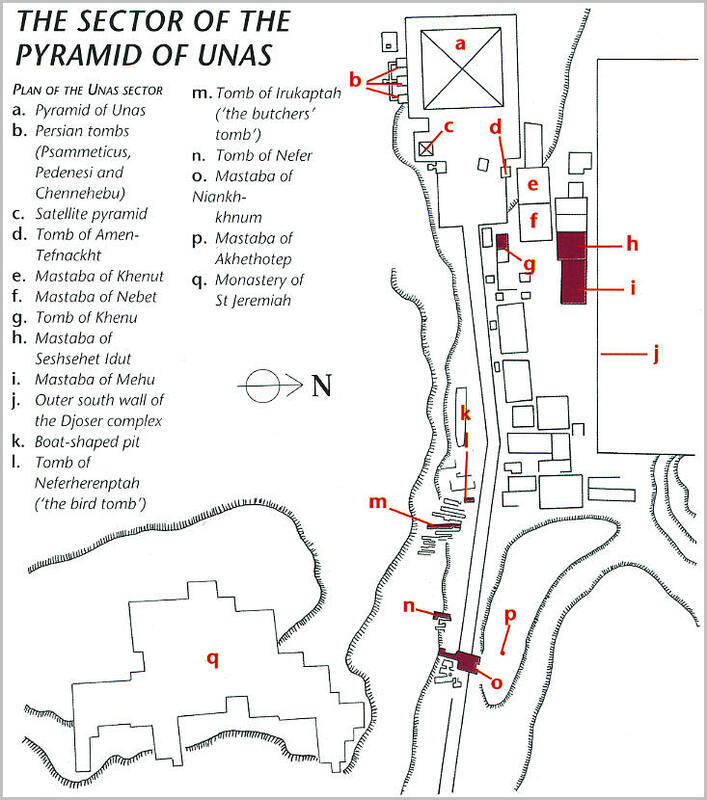 Unas ruled Egypt for ~32 years. There is an inscription on the north face of the pyramid by Khaemwaset, son of Ramses II and High Priest at Memphis, referring to his restoration work. Thus causing the name of Unas to live again. On the south side of the causeway ramp, at the first bend there are two boat pits lined with limestone. The causeway terminates near the ticket entrance of the Saqqara necropolis and the recently reconstructed Valley Temple. There are several very beautiful 5th and 6th dynasty mastabas in the immediate vicinity of the the Pyramid. The most famous is the double mastabas of Nian-Khum and Khum-Hotep ('the twins') and the tomb of Irukaptah ('the butchers tomb'). Click on area of Interest.